What else do you do on long weekends? my mom asked us were we going to join her this year and I told her that I would try some things from it. So last night, I decided to make a dish that would be in line with what we did give up for Lent and in line with the Daniel Fast guidelines. Being home on a mini-vacay, I got to watch a lot of my favorite day time shows – Rachael Ray being one of them. 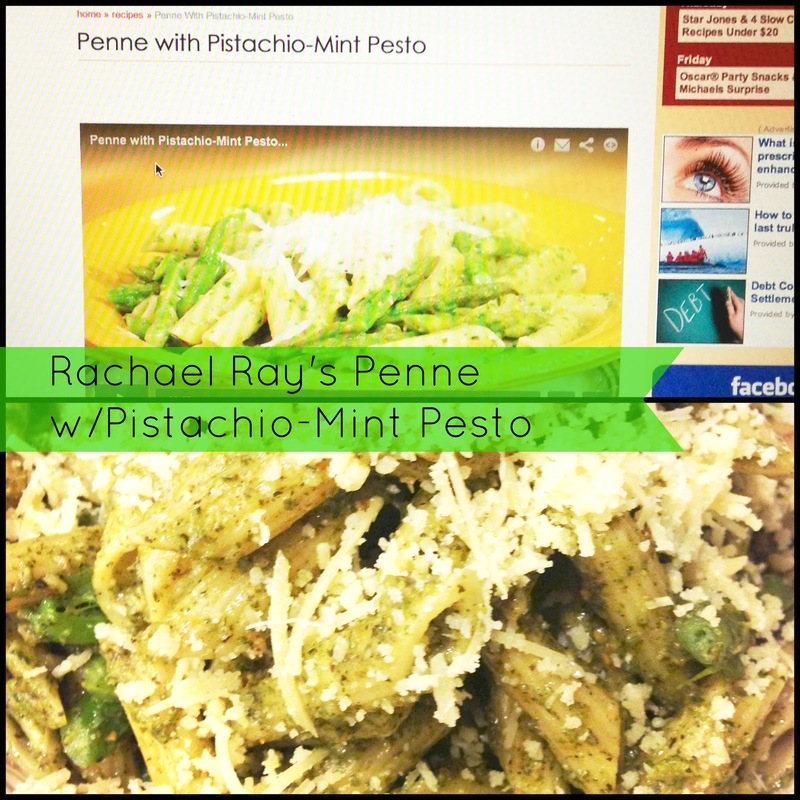 Yesterday she made a Penne with Pistachio-Mint Pesto. I asked my husband if he wouldn’t mind trying it and he didn’t so we set out to get the ingredients from the store. Of course, the way Rachael did things are a little different in my real life kitchen. 1. Rachael cooks in front of a live audience – I just pretend I have one. I usually like to cook with my iPad or Laptop at hand when I am cooking from a recipe. I prepared all the ingredients and placed them all within hands reach. Because once the Pasta is done and the puree is made, it kind of goes fast. 2. 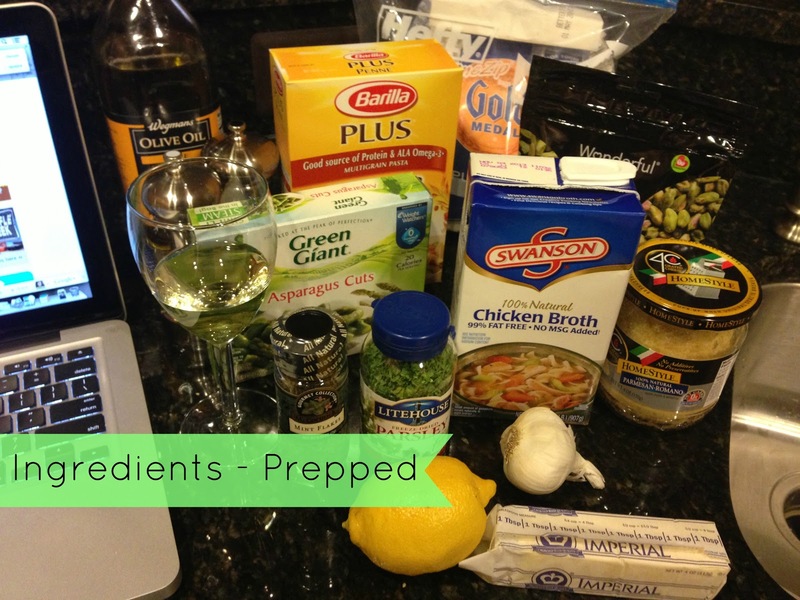 Rachael hand chops all fresh ingredients and does so quickly – no way, I use the freeze dried in the jar. If I love the recipe then I will spend the money to make it with fresh organic ingredients. I decided to use freeze dried instead of fresh – only because we didn’t go to my usual favorite market – Wegman’s. And thats fine. It just meant that I had to adjust some of the measurements depending upon what the bottle said the transfer measurement. 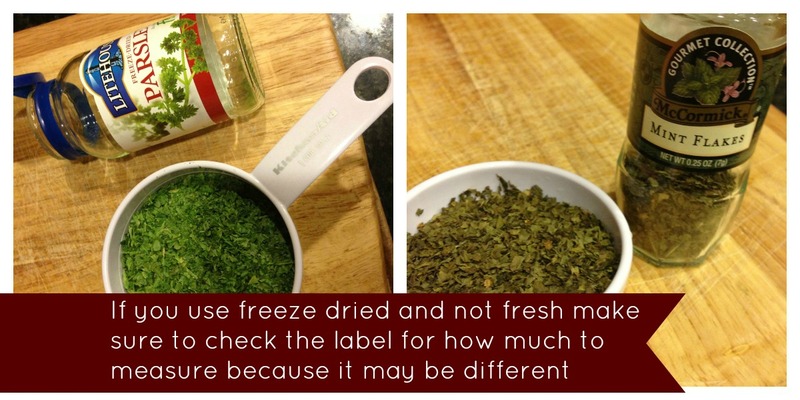 For instance, for the Parsley – 1 tsp freeze dried was equal to 1 tsp fresh. For the Mint – 1 tsp freeze dried was equal to 1/2 tsp fresh, which meant I had to cut what the recipe calls for. 3. 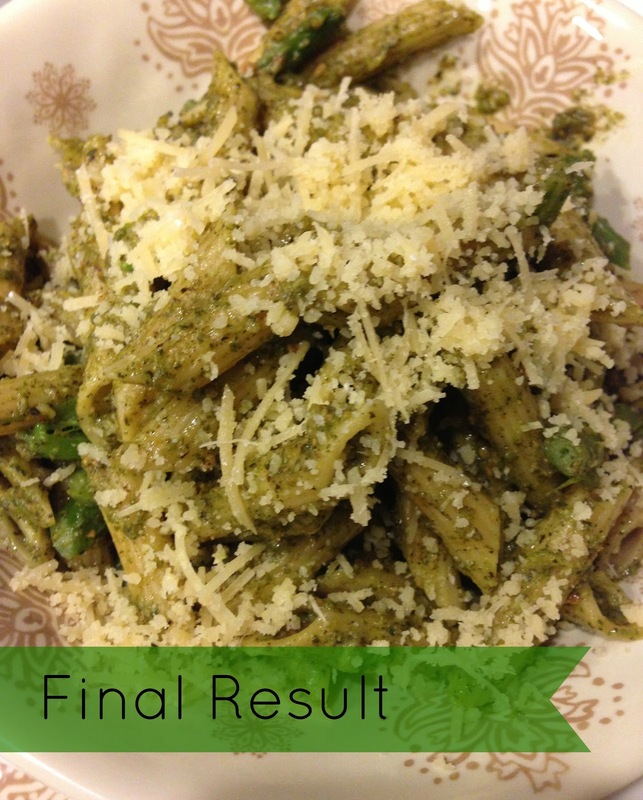 Rachael made her Pesto in a food processor – I made mine in my Cuisinart Blender – It has a Puree button for a reason! I puree’d the Pesto in my Blender and it handled the pistachios really well. It blended everything nice a smooth like. 4. Rachael knows her measurement to a T, although she may fudge it. I on the other hand get a little lost once I start and start misreading the instructions. Oh well! The only thing I didn’t realize was that it only called for half of the chicken stock in the Pesto – I used the whole measurement. I did however have to add even more in the end. Either way, when I watched the show, she said to save some of the starchy water – I forgot and at the last minute grabbed the last bit of water coming through the colander. The other thing I think I may have even forgotten was to read how much pasta. Although I cooked one box, I feel like I had so much Pesto sauce, I could’ve made two boxes. In the end: It was YUMMY! I would give it a you should try this! If you don’t like meat less dishes, this would be good to add shrimp or chicken too. I felt so accomplished, it was my first time making my own pesto – I think that I may have to do that again and just bottle up the extras. Updated to say: I ate the leftovers the following day. It was Yummy the first day, but it was just so much Pesto to me- but next day once out of the refrigerator – I placed it in a pot on the stove with 2 tsp of oil and about a 1/2 cup of water and stirred until the water had boiled out – the consistency of it was SO MUCH BETTER – therefore so much more yummier. I will definitely try this recipe again now. Looks good…I like Rachel Ray…but I CANT STAND her voice! LOL!! My mom thinks its hilarious when I say that!!! I may have to try this recipe!!! Yum – that looks amazing! I love pesto, but I've never made my own. I need to give it a shot! That looks absolutely delicious! I really need to invest in a food processor or blender!!! My blender broke a couple of years ago and still haven't replaced it! Stopping by from Almost Friday Blog Hop and a new follower of yours! That looks amazing! I love how you shared the differences. I also pretend that I'm cooking in front of a live audience, haha.